You will get 1 bag weighing 14 grams / half ounce of solvent resistant, cosmetic grade glitter. I measure all of my glitter by actual weight and not by volume. By volume this is equal to about 5 teaspoons which is just under a fluid ounce. Available in your choice of 9 hex colors. All colors in the ultra fine`size .008 except dark purple is larger sized at .015. (photo4) Red has both sizes available. 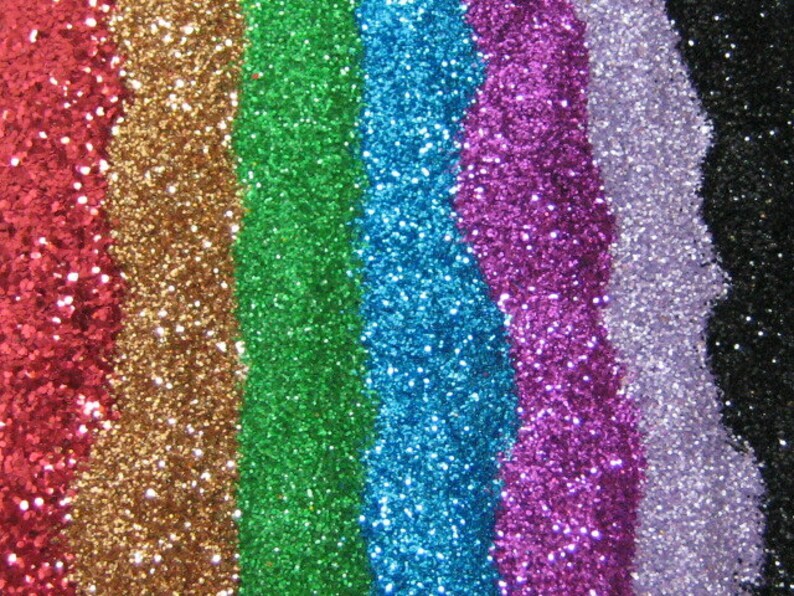 Colors available in super sparkly black, turquoise, grape, copper, dark purple and red, or the sublter shimmer of sugar in light pink, deep yellow, or emerald. Photo 1 & 2 show all colors. Note lavender sugar in photo1 is no longer available. I like it very much & will buy again.